James Bernard Swensen, age 90, beloved Husband, Father, Grandfather and Great Grandfather, passed away on Saturday, June 25, 2016. Born December 4, 1925, in Pleasant Grove, Utah, to Ezra James and Elsie Walker Swensen. He was the third to the youngest of 11 children, four sisters and six brothers and grew up working on the family farm in Manila, Utah and graduated from Pleasant Grove High School. Jim married his high school sweetheart, Carol, in the Salt Lake Temple on January 16, 1946. They had five children, Robert, (Gayle-deceased), St George, Utah; Thomas (Connie), Coalville, Utah; Catherine (Dan Cutler) Chino, California/Layton, Utah; Douglas (VaunaDe), Coalville, Utah; William (Sue), Virgin, Utah. The family lived in several locations throughout Utah during his life. He was a veteran of WWII and always loved his country. He was a member of The Church of Jesus Christ of Latter-day Saints and served in many leadership positions throughout his life. Jim retired in 1986 with the ASCS in Summit County, Utah. Jim and Carol both retired the same year and moved from Coalville, Utah to St George Utah to enjoy their passion “Golf”. 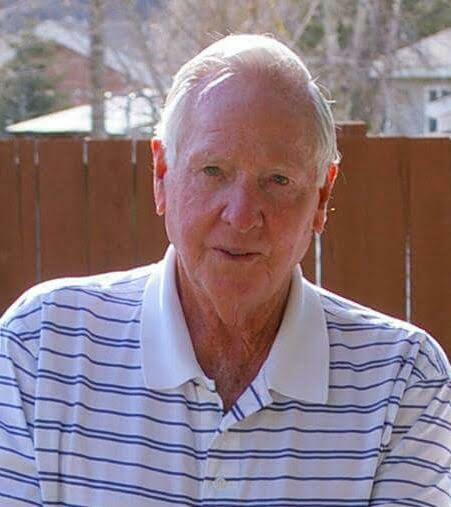 They were members of the Bloomington Country Club for more than 25 years, where they made many close friends over the years, golfing year round until his mid 80’s. Jim and Carol celebrated their 70th wedding anniversary in January of this year. Jim was a genuine, caring, and giving man. He always put Carol and his family first and loved and lived life to the fullest. Jim is survived by his wife, Carol, five children, twelve grandchildren, twenty-seven great-grandchildren, and his brother Morris Dee Swensen, Great Falls, Montana. Services will be conducted with the immediate family at Metcalf Mortuary with interment in the St. George City Cemetery. We’ll miss you and love you lots Grandpa Bear!